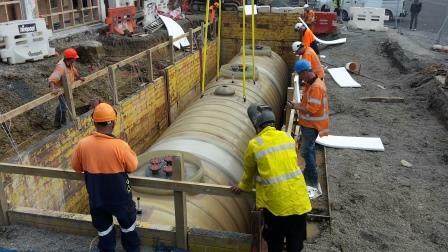 To install this tank an open pit was required 17m long x 4m wide x 4m deep. TSNZ came up with a solution using a combination of Single corner slide rails and parallel slide rails. 4 x 4m modules were installed progressively. 610UB waler beams were attached to the outside of the rails and 100x100 SHS props were placed in the base of the excavation at each pair of slide rail posts to ensure no movement after transverse frame removal. 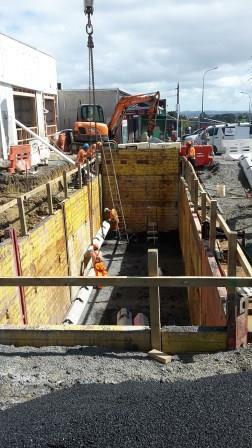 Because of the length of this excavation, TSNZ made sure there was additional support for the walers by the installation of deadman anchors at the mid point and a few metres away from the excavation. Once fully installed, the slide rail transverse frame assemblies were removed to provide a completely open pit to enable installtion of the new tank together with ground anchors. 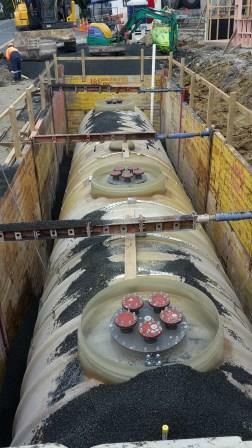 Once the tank was inplace temporary adjustable struts were installed at each pair of parallel slide rails. This was to enable the safe removal of the waler beams. Extraction of the shoring system was a staged process. 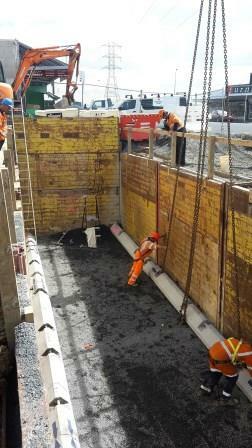 Slide rail posts were left in place as the panels were progressively raised as the backfill was placed. Eventually, the panels were removed, the temporary struts taken out and each post easily extracted.